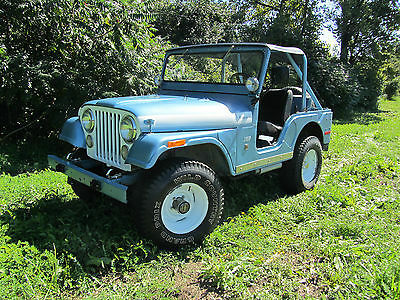 Selling my 1971 Jeep CJ5 Renegade , the original Renegade equipped with the venerable Dauntless 225ci v6-3speed manual transmission. This Jeep is well sorted out. The motor and trans are original as equipped and were rebuilt with less then 10k miles since rebuild. This motor, in my opinion, is one of the best Jeep motors ever used. It is an odd fire Buick v-6. This motor has alot of horsepower and torque and is very compact and light. The sound that an odd fire v6 makes is unique and righteous. It has wheel exit headers and turbo mufflers, not too quiet but not too loud, which makes that perfect sound. The transmission is a B/W T-14A 3-speed. 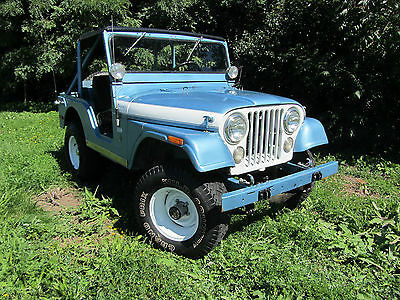 It has a synchromesh first gear so you can downshift at low speed into first unlike earlier Jeep transmissions were you had to come to a complete stop to put it in first gear. 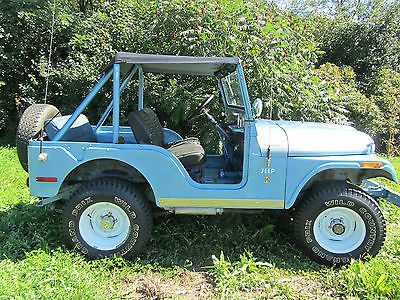 The research I have done indicates this is a late production 1970 Renegade 1 titled and sold in 1971. This Jeep has the 999 340 paint/trim code on the firewall common to Renegades. I believe the original color was plum purple because I can see purple in an area of the rear wheel well where the tire has rubbed the top layers of paint off. This Jeep is licensed and road worthy but I would call this a 90/10 Jeep. Meaning it should be used 90% off road and 10% on road. This Jeep is a rugged trail Jeep that can be driven to and from the trail. This Jeep drips fluid from the front and rear axle pinion seals. It is not a major leak but only a nuisance drip. This Jeep was painted and had its floor boards replaced about 10 years ago and has held up well. It has always been stored indoors. In the pictures you will see some bubbling and cracks in the paint and some rust coming out in some areas (see Pics). This is a very solid Jeep. This Jeep has a heavy duty frame because it is a Renegade and the frame has no rotting anywhere only surface rust. This Jeep has functioning stereo, CB radio, heater, wipers, window washer fluid pump, turn signals, brake lights and reverse lights. It has a horn but the button on the Grant steering wheel needs to be replaced. This Jeep is also equipped with heavy duty leaf spring suspension, a 20 gallon steel gas tank with heavy duty skid plate, locking gas cap, and I have added an electric fan in addition to the stock belt driven fan. The electric fan is a pusher fan and keeps the engine nice and cool when going slow through the trails at low speed and low rpm. The tires are older but have alot of tread and have innertubes in place. I am selling the Jeep with both full Best Top soft top with doors and bikini top included. Both are in good shape. I will also throw in the with the sale a set of vintage slotted mags I bought for this Jeep but never got around to putting them on. 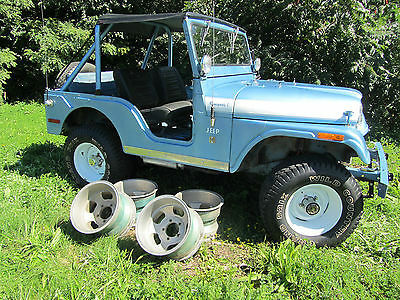 These are deep slotted mags from the '70s and will look perfect on this Jeep. Although I do love the look of the deep white steel wheels on this Jeep also. Jeep is for sale locally. I reserve the right to end listing early if not sold here on EBay. Don't wait. Ask questions. Thanks for looking!